In an early view article from the International Journal of Osteoarchaeology, authors Rubini, Cerroni, and Zaio report on the earliest known case of spondylocarpotarsal (SCT) synostosis, found in a middle-aged woman from the Imperial period site of Grottaferrata, near Frascati in the Roman suburbs. 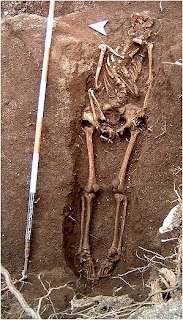 The skeleton was found within a large cemetery population (that is completely unpublished in English and, to my knowledge, is not published in Italian either), and the woman's bones were carbon dated to 50-125 AD. Her skeleton showed immediate evidence of scoliosis, an abnormal curvature of the spine. The authors found atrophy of the left hand, with fusion of all carpals, several metacarpals, and the radius with the scaphoid. There were also numerous segmentation defects in the spine, which they interpret as evidence of congenital scoliosis. All of these bits of fusion and malformation combine to suggest a diagnosis of SCT, which is a rare, autosomal recessive condition. SCT was first described in 1973, and there are only 30 known cases worldwide. Because of the provenance of the find - the bioarchaeology of Imperial Rome is my wheelhouse, and when I work at Gabii, we stay quite near Grottaferrata - I was interested to learn more about this skeleton and the diagnosis. I can't imagine I'll ever find something like this, since it's such a rare condition, but it was an interesting read. Rubini M, Cerroni V, & Zaio P (2011). The Earliest Case of Spondylocarpotarsal Synostosis Syndrome (Roman Age—2nd Century AD). International Journal of Osteoarchaeology (Early View).